Available for download in the App Store, Humanity’s mobile workforce management application incorporates the key functionality of our web-based desktop application. It allows managers, schedulers, and employees to fully take advantage of the application by having remote and immediate access on your phone. 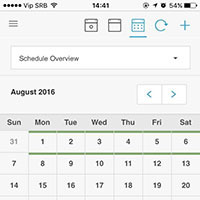 Both our native iPhone schedule app and our mobile-friendly web app are free and accessible by all Humanity users. The app is free for download and accessible by all Humanity users. We also have a mobile-friendly version of our application when you visit www.humanity.com/app/ on your iPhone browser. Humanity’s iPhone App saves me from going to my computer to check schedules and make changes. Now my workers have the ability to clock in/out and add shift notes from the field. Awesome! Being able to check my schedule at anytime right on my iPhone is the best part about Humanity!